Projector Lamps Canada is the most professional low-cost supplier of replacement projector lamps and rear projection TV bulbs in Canada. We are based in Toronto, Ontario, Canada but our focus truly is nationwide. Our company has been in business for over 12 years. We were one of the first companies in the world to start selling projector lamps on the internet. We ship hundreds of lamps to Canadian cities and Canadian towns every week. The quickest way to get in touch with the Projector Lamps Canada team is by email. 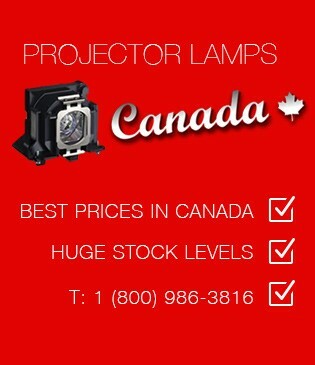 You can send general projector lamp enquiries to info@projectorlampscanada.ca. For the fastest response to your query or quote request use our handy online contact form below. You will receive a reply the same business day. Projector Lamps Canada's dedicated sales team is here to assist you. Please call us toll-free at 1(800) 986-3816. We are available Monday to Friday 8:30am to 5:30pm EST. Our offices are closed on Canadian Statutory Holidays. Our business hours are Monday through Friday, 8:30am to 5:30pm Eastern Standard Time. Email support is available by emailing info@projectorlampscanada.ca. Orders can be placed online 24 hours a day, 7 days a week. If you need to reach us by regular mail, Projector Lamps Canada is based at the following address in downtown Toronto, Ontario, Canada. We do not accept Pick-Ups at this location.